The semiconductor symbols below show some graphic presentations of commonly used semiconductor components such as MOSFET, Bipolar, Junction, Transverse, Ohmic, Unijunction, Darlington, Latch, IGFET, Diode, Tunnel diode, Varactor, Diac, Triac, Controlled switch, Controlled rectifier, Four layer diode and Photodiode symbols. The Semiconductor symbols are smart, industrial standard and vector-based for electrical schematic diagrams. Most of semiconductor symbols can be changed in their appearance, style and color according to users' requirements. MOSFET has some different appearance by the function. The basic symbol is generally a line for the channel with the source and drain leaving it at right angles and then bending back at right angles into the same direction as the channel. In our electrical diagram software, you can modify the shape data to change the shape's appearance easily by the action button. The following table shows the different drawing type of MOSFET symbol. A bipolar transistor is a three-terminal electronic device constructed of doped semiconductor material and may be used in amplifying or switching applications. A semiconductor junction is a type of junction in which a metal comes in close contact with a semiconductor material. The following images show more semiconductor symbols for breakdown diode, tube diode, tube triode, tube triode, tube pentode and turn-off triode. All the semiconductor symbols are smart. You can modify them with one click action button. 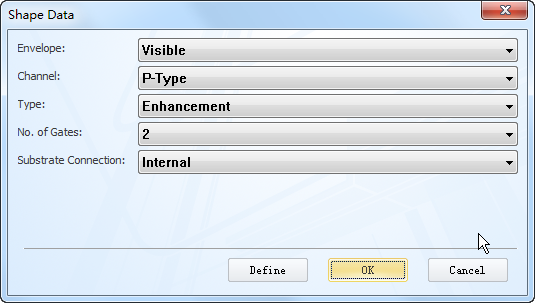 In our electrical diagram software, you can use the action button to choose the suitable electrical symbols with one click.